The process by which files are transferred to the web server is called “FTP” (File Transport Protocol). You have unlimited access via FTP 24-hours a day. As such, you can create and maintain your web pages on your own computer and upload files to your web site at your leisure. The hostname tells your FTP software to connect to the web server upon which your web site resides. In general, the process of configuring the various FTP software/interface is the same. You can enter this information into the fields at the top of the Filezilla program and click “quick connect”. You should now be connected to your web server. When you connect to the web server, you will connect directly to the root (“home”) directory of your account. On the left hand side of the screen is your local computer files and on the right hand side are the server’s hosted files. Your web page document root is /public_html. 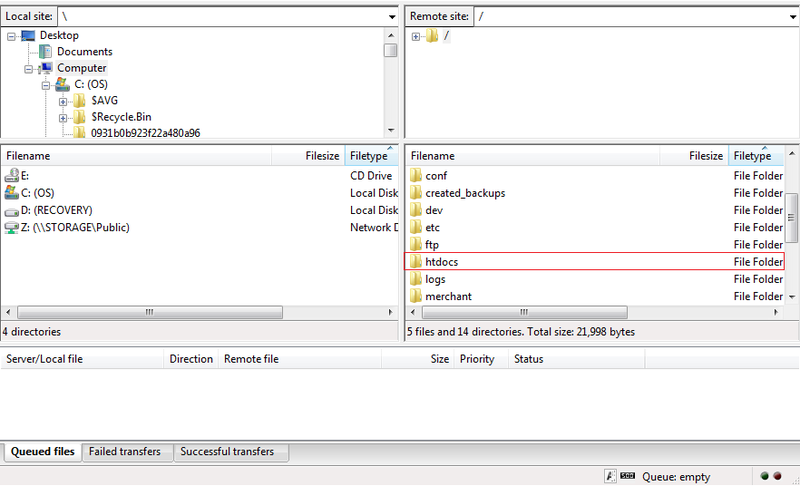 You can transfer files directly to the /public_html and/or create subdirectories. Another system directory that you may need to use is cgi-local; this directory is reserved for custom scripts. To make your home page load automatically, name the HTML document “index.htm” or “index.html” in lowercase and upload it to the /public_html directory of your account. To upload a file or files, simply click and drag what you want to transfer from your computer and into the folder you wish to upload to. In Filezilla you will see your queued files on the bottom window. See example below. As soon as a file is uploaded to the web server, it is available for all to see. If, after uploading a file, you are still unable to see the updated file, you need to clear both disk and browser cache. Simply click the “Reload” or “Refresh” button on your Web Browser.